It’s a scene I’ve been a part of too many times: standing up in front of a group of people, I stumble through a speech while asking myself why I hadn’t prepared more. You may know how it feels – discomfort, regret, and even fear. Ummo, described by the developer as “your personal speech coach,” is here to make the process significantly more comfortable by providing key data on your presentation. Paired with a feature that annoys you every time you use a filler word, the functionality of Ummo is enough to make you wish you had it sooner. Note: For testing purposes, I used the text of Steve Jobs's commencement address as the speech. You can find that in full here. 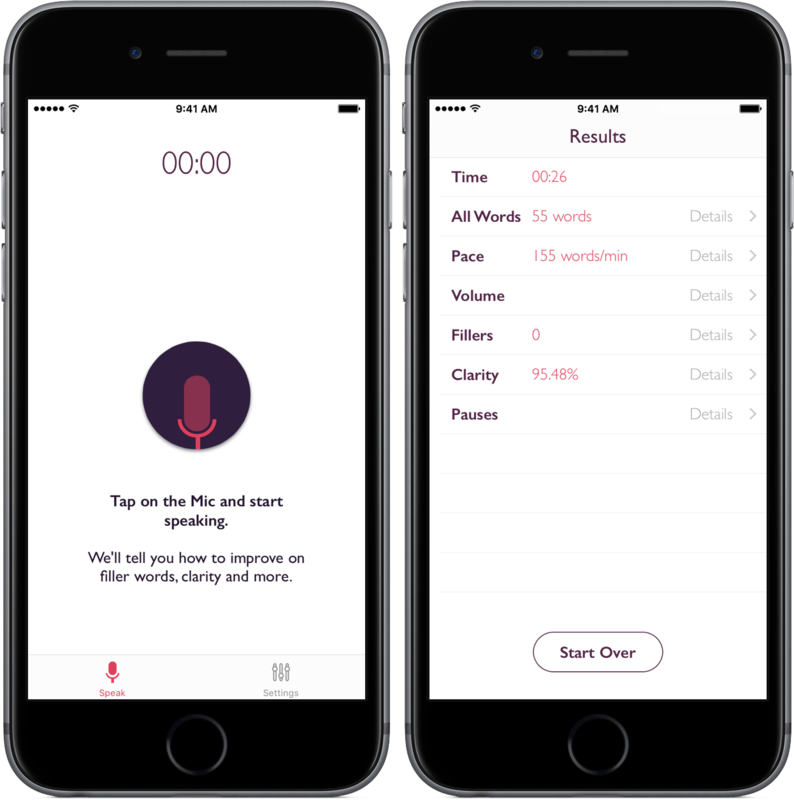 Unsurprisingly, the first step in creating the best speech with Ummo is letting the app hear what you have written. This may seem a little weird at first, especially when you realize that the app is attempting to log every word you say. To record, you’ll tap on the microphone icon, wait roughly five seconds, and then begin speaking. At the top, you’ll see a timer that tells you how long you’ve been speaking with Ummo. The words you speak will be displayed near the bottom. While you speak, you’ll see Ummo’s first unique feature – or, rather, hear it. Every time you say a “filler” word (uh/um, I mean, actually, you know, etc.) Ummo will display that word in red and play a sound. You’ll notice pretty quickly that you’re doing something wrong, especially with a ringing sound blasting from your phone. Once you finish your speech, Ummo will show you relevant data in the form of seven results. This information, along with the training received while giving the speech, is meant to aid in improving how you speak publicly. Below is a summary of every set of data Ummo presents. Time: The total elapsed time you spoke to Ummo, from the end of the five second countdown until tapping the button to stop the timer. All Words: A collection of the most frequently used words in your speech. Displayed in a bar graph, you’ll see word counts, along with the speech in its entirety at the bottom. 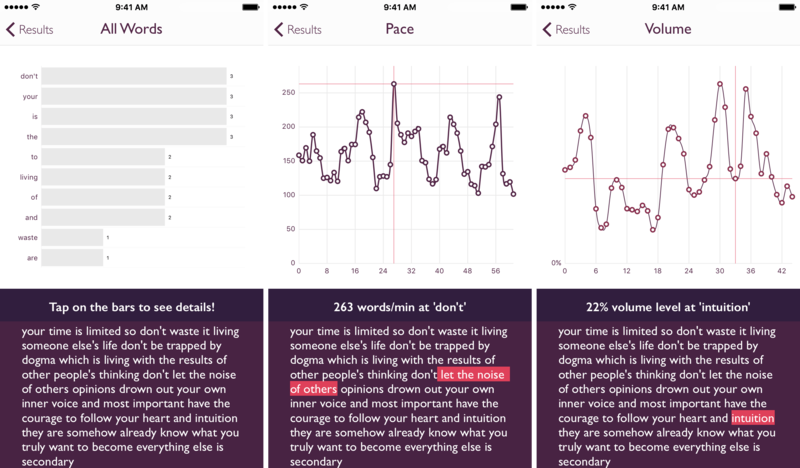 Pace: The speed of your speech in words per minute. By tapping on a point on the graph, you can identify parts of the speech that need to be faster and slower. Volume: Depicted as a flowing graph, the volume section displays how your voice changed in volume during your speech. Although the volume is displayed in a percentage, I’m not sure what system Ummo uses to assess the recording. 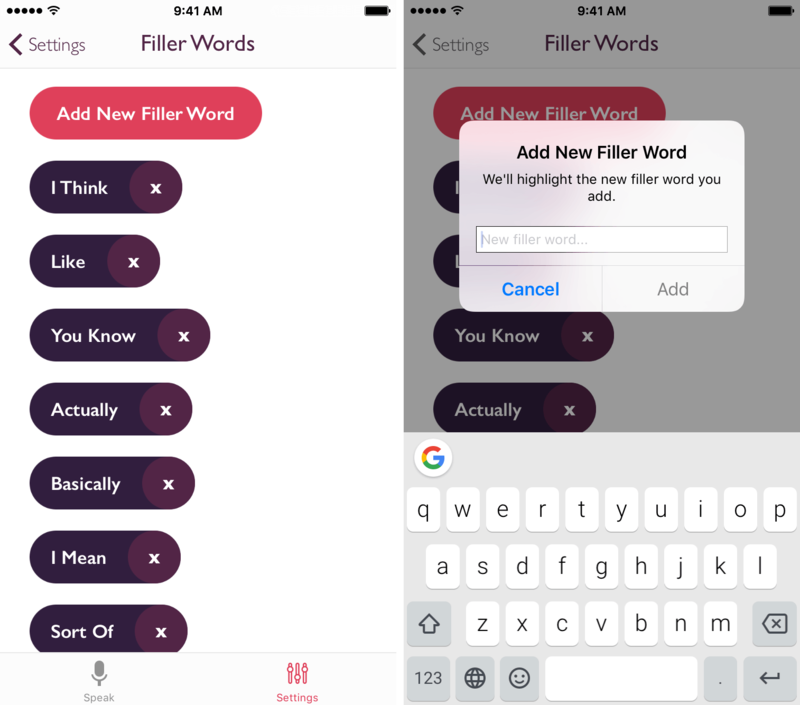 Fillers: Similarly to the All Words section, the Fillers portion of the data uses a bar graph to let you know what words to eliminate. As you use fillers more often, Ummo will adjust the graph for comparison. Clarity: Another graph depicting how well Ummo understood the words you were saying during the speech. I’ve found that Ummo sometimes struggles with speech recognition, but it is more often accurate than not (I also could just be a terrible mumbler). Pauses: A summary of the pauses recorded by Ummo throughout out the speech. The y-axis is the length of the pause, a useful piece of information that recognizes purposeful or accidental break in the speech. With all of this data, Ummo acts effectively as a hub for anything you might want to know about your speech. Although it’s not perfect in what it believes you say, it offers enough basic information to give the right directions for improvement. One other problem worth mentioning is that Ummo, on certain occasions, couldn’t transcribe at the same pace I spoke. Practically, this is quite a big issue when it happens – for an app that promises to catch fillers, being a few seconds behind can cause it to alert you for a filler you said many words ago. For the majority of people, giving a speech isn’t a regular experience. When it’s needed, however, a tool to help to make the process as easy as possible is greatly appreciated. With Ummo, you’re getting an easy-to-use app that remains impartial, instead giving the most useful data in simple ways. 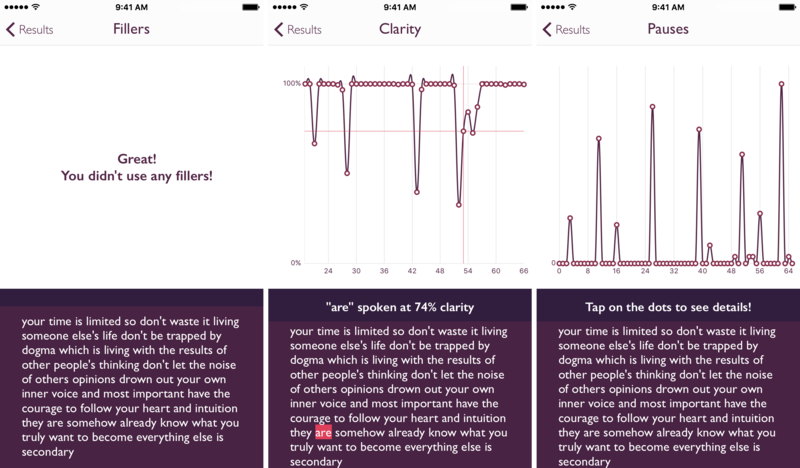 At $1.99, the app offers a one-of-a-kind experience that is undoubtedly worth its price. You can pick up Ummo in the App Store here (iPhone only).